If there is a combination that just screams Valentine's Day, it has to be chocolate-strawberry. The quintessential romantic dessert is chocolate covered strawberries, so of course anything with that flavor combo will seem romantic and indulgent. Since strawberries are just starting to come into season, I knew I wanted to share a fun Valentine's dessert that featured them. I considered whoopie pies, macarons, or mousse, but since cupcakes are really my true love, I went with those. I used my favorite chocolate cupcake recipe, and topped them with my favorite strawberry buttercream recipe. I actually shared this recipe for chocolate cupcakes in the early days of my blog, but it is kind of buried within another post, and I've made some changes since then, so I'm going to share it here as well. If you are looking for ideas for dinner and dessert for the big day, check out my Featured Recipes page. I've updated it with what I think are romantic meals! Preheat the oven to 350 degrees. Seperate cupcake liners into muffin tins. Fill each muffin tin 2/3 full, and bake 18-20 minutes, until a toothpick inserted into the center comes out clean. Cool 5 minutes in the muffin tins, then transfer to a wire rack to cool completely. Puree the strawberries in a food processor. With the mixer on medium-low speed, add the butter 2 tablespoons at a time, mixing well between each addition. Scrape down the sides of the bowl, increase the speed to medium, and mix until the buttercream comes together (it can take up to several minutes, but it will come together eventually). Switch to the paddle attachement and beat at medium-low speed to remove air bubbles, about 2 minutes. Gradually add the strawberry puree, and mix to combine. 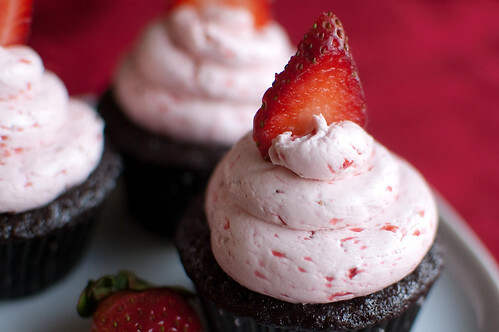 Frost cupcakes as desired, and garnish with strawberry slices just before serving. These are GORGEOUS! And I love both flavors- perfect for VDay! Chocolate and strawberries are definitely V-Day classics. I adore swiss meringue buttercream as well and the thought of it's buttery flavor with the sweetness of strawberries has me swooning! "Since strawberries are just starting to come into season..." this alone almost made me close the post out of jealousy ;) But I stayed. Because I love chocolate and strawberries and if I had these this valentine's day I'd almost forget about the mountains of snow currently covering any and all places where strawberries would grow around here. All I will say is that I will be making these... hopefully sooner rather than later. Great photos, too! 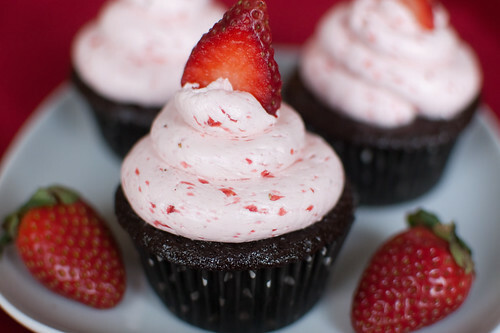 I love chocolate and strawberries - that frosting looks so good I want it right now! lol! the cream on those cupcakes looks delish! ummm this looks like a little slice of heaven! These look absolutely delicious (and gorgeous)! I really need to make swiss meringue buttercream at some point. Swiss meringue is the absolutely best. And this one, studded with delicious strawberries, looks divine. Did the frosting yield enough to frost all 30 cupcakes as pictured? Allie, It might be cutting it close - I use a lot of frosting. So if you're worried, you could always make 1.5x the frosting recipe, and if you have any leftover, it does freeze well. Hope that helps! I made these for a Valentines Dinner with my hubby and they were a big hit! The frosting was especially amazing! Thanks for sharing the recipe. Oh my goodness, these look fantastic. And of course, it's easy ingredients - but I don't have buttermilk at my house, only regular milk. Should I make a trip to the store before I make these, or will 2% milk suffice? I know it's not ideal, but I also know I won't have any other reason to actually use the Buttermilk! 2% will be fine - enjoy! How did you make your frosting so pretty? I made these today and they taste amazing but my frosting (first attempt with a pastry bag and round tip) was a disaster. Thanks! The frosting wasn't set up, or you just had trouble piping? If piping was the problem, it just takes practice (what a good excuse to eat more cupcakes!). If it was the frosting itself, it sounds like maybe it wasn't set up before you tried to pipe? If that's the case, it just needed more time in the mixer. Hope that helps! This icing was AWFUL! It was far too runny and just tasted like butter, despite following the recipe perfectly. Definitely not something i'll make again. The cupcakes were, however, quite decent. That Hershey's recipe is one of the best chocolate cakes out there, so I'm sure these cupcakes were awesome. Love all those strawberry flecks in the frosting! Sorry the icing didn't work out for you. It sounds like perhaps you had some issues with it setting up properly. I have actually made this particular recipe several times, and it hasn't ever been runny. Swiss meringue buttercream should be buttery, but not overly so. It definitely isn't as sweet as classic buttercream made with confectioner's sugar, but I've actually found this version to seem less buttery because of the strawberry puree. Again, sorry you weren't a fan! just wanted to let you know that this meringue buttercream recipe is so amazing! i made it twice--the first time for my boyfriends bday cake and the second time for my two friends! (because they loved it so much at my bfs party). i don't have a fancy mixer, so i just used a hand mixer.. and im not sure if i overwhipped or underwhipped the cream. but after i let it sit for a few hours the strawberries really added to the buttercream and it tasted like strawberry ice cream from my childhood days! so delicious :D thank you! I just made the cupcakes, and followed the recipe ad pedem litterae. They taste delicious, but I can't get them out of the muffin tins :S they caramelized and the crust is attached to the borders as if it was super glued. What am I doing wrong? Luli, that happened to me once, and I think it was because I overcooked the cupcakes a bit. It also sounds like maybe they were overfilled a bit if they were sticking to the tins. Sorry you had problems! I'm glad you still enjoyed them though! I just made swiss meringue and it was all runny but I think it's because I didn't wait for meringue to cool completely and butter wasn't room temp yet so I used microwave... I KNOW I KNOW... I shouldn't have! It's in fridge now. I hope that helps! UPDATE: Put in fridge for about 10 minutes. Rewhipped and it's PERFECT! Yaaaaay! Made these this past weekend for a dinner party and they were a huge hit. The chocolate cupcake was so moist and flavorful! I was nervous making the frosting, but it turned out beautifully! Thanks for a great recipe! I'm gonna try this recipe as my first cupcake recipe! Does it yield 30 MINI cupcakes or standard-sized cupcakes? I would love to make these for Valentine's day, but Strawberries are not in season in Canada in February. Do you think Frozen strawberries would work well if you thawed and drained them? Hi, these cupcakes look amazing.. Im making them tomorrow but wanted to know if they would be ok for travel? About 5hrs. Should i leave them at room temp or put them in the fridge? Covered or uncovered? Thanks. Anonymous, I'm so sorry - I just saw this. I hope they turned out okay. For future reference, I'd put them in the fridge, covered, the night before and then transport (still covered). Sorry again. Ihope they worked out! I made these yesterday and the cake part was amazing. When I made the meringue the first time it was perfect, but I didn't ice them then because it was late at night so I put it in a bowl in the fringe. The next morning it was very stiff so I let it sit out and it looked like cottage cheese. So I threw it away and tried again but it turned out chunky and I couldn't use it. I didn't want to make a third batch so I just made a quick cream cheese frosting and put a strawberry on top which was very good but I wanted to taste the meringue with the cake. Cali, did you mix the frosting at all once it had come back to room temperature? SMBC can separate like that, but it should come back together after a few minutes in the mixer. Sorry you had problems! I just made these cupcakes. They were AMAZING! The icing is so light, fluffy & yummy (and I'm not an icing fan)and the cake was perfect! I am in love! The icing was runny at first but I just continued to mix it and it came together perfectly after a few more minutes. I will definitely make these again...and I'm sure my husband won't mind. He kept eating the cupcakes before I had the icing finished. I had to send him to bed so I had some left to ice. Could the butter be switched with shortening? We have a dairy allergy, but this frosting looks so yummy! Candace, I don't think that would taste very good at all since butter is the predominate flavor... If you wanted to make it dairy-free, I would try Smart balance or something similar instead of shortening. But then again, I really don't like shortening. How important is the coffee? I am not a fan of anything coffee flavored, so I would like to extract that ingredient. Will this mess up the cupcakes? I'd say it is pretty important - it really doesn't make the cupcakes taste like coffee, it just enhances the chocolate flavor. If you are adamant about omitting it, I would still use the same amount of boiling water though. Does this make 30 mini or standard sized cupcakes? They look divine! I made the cream today, but it was a bit runny. Do you have any tips on how to make it not runny? Katherine, do you mean the frosting? It sounds like it just needed to be whipped a bit more - or perhaps it got too warm and needs to chill and then try again. Hope it turn sour! does the coffee has to be cold or hot? and is it 50% water and 50% coffee? I just made these (they are in the oven) and I can't wait to see how they turn out. I'm a little concerned because the batter was very runny. Is that normal? I'm sorry you're having trouble! The 2 fixes I use are refrigerating for an hour or so, and melting a small portion in the microwave and then beating it back into the rest. I usually just do it for maybe 10-15 seconds. When you whip it out of the fridge, I would let it get close to room temp before trying... the butter is just too cold and as you saw, will separate from the strawberries. Maybe let it warm back up a bit and try again? Hopefully you can get it to turn out, and hopefully this helps some!